Young Identity (YI) was formed in Moss Side, Manchester in 2006. It is a twenty six strong group of young poets, led by senior poets, Shirley May and Frisko (Ali Gadema). Young Identity has at its core a Poetry Slam team. This team represented Manchester in the WORDCUP2006. This year, Frisko and Shirley May will work with a new YI team to compete in WORDCUP2010. Inna Voice, the senior wing of Young Identity, will be featured as the opening act of the WORDCUP2010 Final. Ali Gadema, a.k.a Frisko, has been working as an established rapper, poet, hip hop theatre practitioner and educator nationally for many years. He has received national and international recognition performing in Jamaica, Washington DC and other places around the globe. Under the alias of Frisko Dan he founded Freestyle Mondays, a night of improvised lyricism and beatbox at Contact Theatre in Manchester. 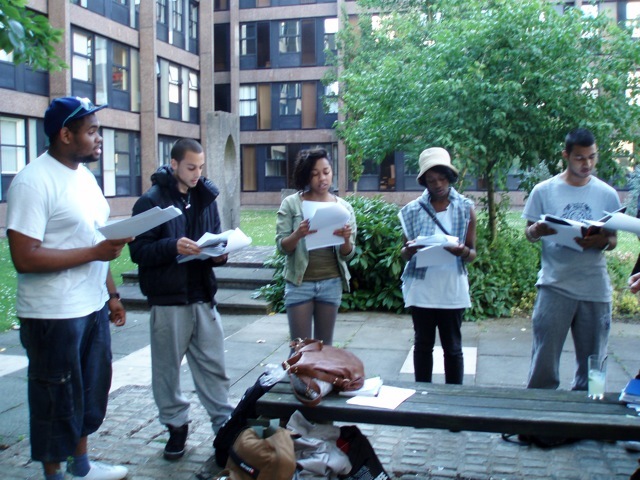 In 2005 Ali started Sharpening SAWDS, a hip-hop arts collective working with both established artists and young people from urban communities to produce dynamic and high-octane hip-hop theatre. Shirley May is a published poet and spoken word artist. She has worked in performing arts for many years and has a wide range of project management experience in the creative and community arts sector. She is the co-founder, with Ali Gadema, of Young Identity, a group of young poets led by senior poets, formed in 2006 in Moss Side, Manchester. Young Identity has at its core a Poetry Slam team, who represented Manchester in WORDCUP2006, led by Apples & Snakes. Shirley May is a winner of the North West Poetry Slam and has performed extensively at prominent venues across the North West, including Yard Theatre, The Pankhurst Centre, Contact Theatre and more. She has been published in numerous anthologies, including The Suitcase Book of Love Poems (Suitcase Press, 2008) and Hair (Suitcase Press, 2006). As a poet and facilitator she works regularly in schools and Young Offender institutions.